Went from 35 to 39/44 download (results vary). But going from 1 to 5 upload is the bees knees! Woah. How did you get 125? I thought the max was 114/115? Generally I think my area is pretty free of congestion, so that might play into it. But I’m not 100%. Maybe just lucky!? Confirmed at Wooloowin 4030 very nice, thanks for sharing OP and good work Telstra! I’m in Windsor 4030, worth switching from Optus to Telstra? Assuming Optus Cable? I have never had it but hear it can be dodgy, probably worth switching if you can get a good deal I'm on $80/month 1Tb with speed boost, still have some issues in peak peak time but its pretty solid. How did you manage a free speed boost? Any tips of what to say or leverage them with? How did you manage a free speed boost? 5G internet is going to take over. From the sky beats underground cables, from many perspectives. Mobile internet works great alongside wired internet. The mobile network couldn't support all of the internet traffic by itself though. Bamboozle on 21/04/2018 - 10:26 Comment score below threshold (-3). Name on 21/04/2018 - 12:49 Comment score below threshold (-1). Bamboozle on 21/04/2018 - 16:03 Comment score below threshold (0). Wibbleman on 23/04/2018 - 07:59 Comment score below threshold (1). No it's not, and no it doesn't. The winner of the internet is BNR32. Thanks for posting. Thanks for the post, the perfect type of deal. More Internets for free! I've been in Australia for four years and broadband here is a shame. In 2015, I was living in the city and had FTTB from TPG, which was amazing. I then moved to West Melbourne where only ADSL was available, still provided by TPG. That was a reasonable ADSL as expected, I could watch Netflix and stuff… I moved again to Northcote and had Optus cable, and that was great, no problems at all. I moved again to a different neighbourhood 5km from Melbourne CBD and Optus moved my cable to ADSL, and that was frequently worse than dial-up in terms of speed and stability (at times, a page will open after 30 seconds - like I used to experience overseas, more than two decades ago). I contacted Optus several times, they changed some configurations, the speed improved but the service was totally unstable. They accepted my cancellation request without charging a cancellation fee. I am now with Telstra cable and that`s perfect. After reading a lot about this outdated NBN plan and people complaining, I am glad NBN is not available here, and I will stay with Telstra (cable, hopefully) as long as they keep offering a reliable service. The upload speed was my only issue and that now seems much better (I restarted my modem days ago and noticed the new speeds, particularly the upload). I just moved into an apartment that has TPG FTTB. It's fantastic. SO glad I don't have to deal with the NBN. I have had adsl from Optus, then when I moved cable from Telstra. 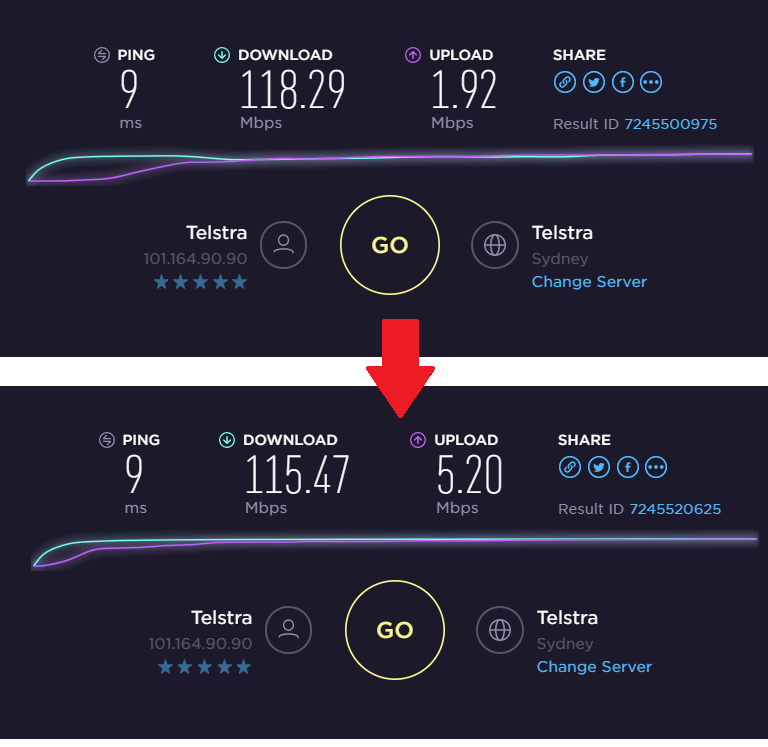 I changed from cable to nbn and after getting a free upgrade to 100/40 and a better model I am find it better than cable. If you are happy with you speed don’t change for as long as you can (from cable) as I had to argue to get a decent nbn service as the basic package is not adequate for what I need. If i get a connection now will i get 30mbs or the new 55 mbs? Possibly 30Mbps….and then 55Mbps after a power cycle! Was already on free speed boost although 2meg upload.. now 5 meg thanks for the post..
Be interesting if our Ring doorbell works any better. It has been flakey with connections and empty blank videos, Ring support blame 2meg upload. Although I have 9 Hikvision cameras I can connect to no problems at 2meg. Makes me want to sign up telstra cable now. My adsl upload is currently 0.70 mbps sigh….. FTTN is taking forever coming to my area. Power cycled, still 30/1. Cable, not NBN. Anyone in WA confirm that this works? Yep, worked for me also (I thought this was some kind of sick joke). I just power cycled the cable modem which is plugged in to my Asus RT-AC68U and viola 5.15Mbps up! Yew! I am in Prahran, Melbourne. Just did the 'switch-off' as suggested. Before - down 36.2, up 0.5. After - down 57, up 5.2 . Thank you so much OP! Confirmed working for me as well! Went from 118dn/2up to 30dn/5up. FFS. Looks like they stopped my powerboost. Did a hard reset of the modem and now all good. Looks like data has gone up from 1TB to 1.5TB as well. That data increase happened a couple of months ago already for most users and is not related to these new speed settings. 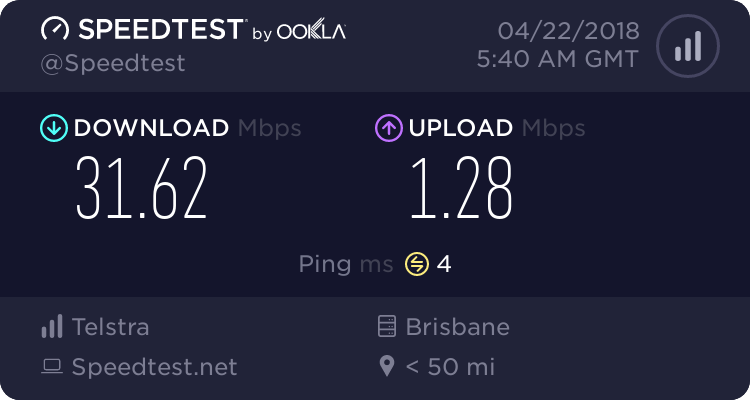 I'm on Telstra cable with speedboost, but my upload doesn't seem any better. Tried restarting the device through the web interface, and physically unplugging it… Upload is still sitting at just over 2Mbps. Hell yes http://www.speedtest.net/result/7245559034. Now I'll wait out even longer before jumping to the NBN HFC dl speed downgrade. Rather turn it off and then wait a few seconds and then turn it on back again. Otherwise "Reboot Router" via web browser. For anyone going "nope nothing for me". Not every area has it yet. It's been rolling out for over a week starting in Adelaide then Perth. Only more recently some areas of Brisbane/Gold Coast, Sydney and Melbourne. Might be tonight tomorrow or sometime next week for you. :) Maybe even be the following week. I had known about it since it started in Adelaide but took 5 or 6 days for it to get to me in Brisbane. Basically it's just the config file in your modem changing like new firmware it isn't everyone day one but a slowish rollout. Anyway a simple power button press on the back off and on is enough. If it does nothing then try again the following day. Also to anyone complaining about their download speed being affected. EG dropping from 100+mbit/s to under 50 for example check to see what config file version you have in your modem. Also a good thing to point out is if you use a 3rd party router for your routing. Make sure you update any QoS settings in it. As if it thinks you only have the older speed entered that is all you will get. This was actually rolled out months ago but has been slowly making it's way suburb to suburb, state to state etc. Unlimited data came to me at the start of the year. This actually makes working from home usable, the 1Mbps was killing me when using RDP/VNC to connect to the office…. It works! Thank you OP! I'm on cable but using Telstra's Technicolor modem. It doesn't seem to work for me. Could I request a new model for free? Or is it not covered by them? I get a 31mbps download and 1.3 upload. That's standard cable speed right? I have had this modem for a while now, do you think that could be a problem? Just pull the power cable out from the cable modem (not the technicolor modem/router) for 1 or 2 mins. When you reset the technicolor modem it doesnt always reset your ip. Cable ip address is pretty 'sticky'. Life just isnt fair, we were 5 days from hfc nbn before they canned it. Now update says jul-dec 2019 wtf! Now i dont know if i should ditch adsl for cable, such massive fees to sign up. Switched a year ago and it is worth it easily. ADSL was crab for me got max 12mb down so couldnt stream 4k and downloading steam games took forever. Thanks OP, worked for me too! Thanks OP! Speeds have been really slow lately. We have 100/2 (speed boost) but lately been averaging 30mbps download, sometimes less and lots of drop outs. Really poor service, but this brings it up to 84 down, 5 up (at least for now) so very happy. Thank you OP. I did this and can also confirm it worked. I'm more excited about the upload speed. FINALLY I can upload a set of DSLR pictures in under an hour. Instructions unclear, modem now stuck in arse. Did you turn if off and turn it on again? Worked like a charm. Thanks OP! Just tried with my modem and it worked like a charm, thanks OP!! Worked but damn it shame it couldn't be 8mbps up ……..
Cable modems were never available retail here - the MAC address is tied to your account and used for authentication. Working great for me in Brisbane after the reboot. I'm glad I'm not paying for speedboost - totally not worth it if the upload speed is the same. It's pretty rare that I see much real world benefit in the extra down. It doesn't work for me. It seems slower than below? I also have a gateway max and tried rebooting on the website. Worked for me, from 36.41/1.12 to 57.71/5.28 now. The connection speeds quoted are theoretical maximums and as more end users are granted access to higher speeds we will see more degradation. As any network manager will tell you the more bandwidth you provide the more people will use as they become accustomed to being able to operate new services that maximise the enhanced throughput. The NBN plan never really took proper account of this. Unfortunately the future is bleak for most of us. Without greater investment by telecoms the capacity just does not exist to support the 100+Mbs connections for all. Something the Government just did not regulate tight enough when doing their deals with the telecoms. The contracts poured billions of $ into a system that milked it and made a lot of people very wealthy instead of actually engineering a solution for the future. Many parts of the nbn have already maxed out during peak times well before they have reached their rollout figures. Now that a better understanding exists of the monopoly design the situation is causing providers too cut many corners but still offer speeds that just are not sustainable. Enjoy while you can ! You are mixing nbn in here with Telstra’s own network. They are not the same. NBN are constrained by cost. Decisions have been made to share bandwidth to reduce that cost. ISPs can sell bandwidth that consumers will never realise due to this architectural decision. Telstra on the other hand have a dedicated network that they have full control over. They are not sharing bandwidth with other isps and have full visibility of current utilisation. Connection speeds are not theoretical maximums. They are the speed at which you connect to the service provider. The capability of their network to handle it is up to good network design - over subscription is always assumed as not everyone will use 100% of their bandwidth all the time. A good ISP will properly manage this. What happens when you connect to a service on the internet is always going to be slower as it’s through shared bandwidth. There are many strategies used to provide improvements through content delivery networks, peering and bandwidth upgrades. IMHO Telstra understands this better than most in Oz. The positive part here is upstream connectivity has been limited which has now improved significantly. This is unlikely to be limited by congestion. I have question, is it possible for any ISP to honestly deliver dedicated uncontended lines(Or even shared, just that need to have enough to support everyone who goes full speed on their own respective connection plans) to each and every individual/businesses/households/buildings/etc. at a reasonable price, so it's like not outrageously over priced premium price point, whilst still making a profit after all expenses accounted for, in relation to the NBN? Because the cost must either be too great to provide such a feat and so they need to cut corners somewhere OR they are greedy bastards who would still prefer turning a profit over customer satisfaction….or both! Has anyone ran the numbers for such a possible business plan? Its all by design. Network protocols in use in the internet use a concept of assuming there is never enough bandwidth to reach a destination. Latency is typically the measure used. Trying to simplify a little - Just think that if you presumed you needed 100 mb for every user. Now connect 1000 users in an area, that then feed into 1000s of other areas to create a region that are then aggregated into states, that are then passed onto other states and into 100 other ISPs or routed to other countries to then be sent through their infrastructure to the destination (of which they have no control over). Good network design supports fair use from all users (but not 100% of the users 100% of the time). Networks and the internet will restrict the ability to establish a dedicated bandwidth option available for you to consume a service. It will always be a shared service running across multiple ISPs with their own policies around traffic control. Barring a dedicated Point to point link, you cant guarantee anything. Telstra do have something of sorts that will support this Telstra Programmable Network, but its in the realms of business use and serious dollars from a telstra managed network into points of presence (not from your residence to a source). @Wibbleman: Ah, so the only possible way for this to work out is if your ISP owns everything globally worldwide and has complete control over all networks their clients use, so effectively own the internet; which is practically impossible of course….unless you somehow pass a law that states there can only be one ISP throughout the entire planet and that that ISP controls everything internet related which would of course breach privacy unless they also have a strict policy on that too which saves that but then that would then contradict the need to control all of the internet to succeed in this plan to work out…. Thanks for notifying us OP. Down stayed relatively same at 113-115. Up went up from ~3.5 to 5ish. Gosh, I wish I had Telstra Cable so I could get a free speed upgrade…. Good thing I signed up for Cable a few months back. I just seen my NBN has been pushed back even further, now Jan-Jun 2020* :) (I reckon they actually mean end of 2020, or 2021) You little ripper. Our Cable has been great and now with /5 uploads - double ripper! Cheers OP. Worked here. Thanks for calling this one out. Before = 24Mbps down, 1 Up. Worked for me but now I can't open some sites, any ideas? Anyone with speed boost try cancelling the speed boost and still get the same speeds? Thanks OP in Nunawading went from 36.18/1.1 to 56.85/5.2. Would this work for customers whom use Telstra line but a different provider? My upload has gone up as well. My service provider is Belong and they use Telstra lines for internet supply. Will my internet speed boost doing this reboot ? ok Finally got it to work by doing a complete hard reset of the modem. That is by pushing the reset button under the modem. I have to neg this as since doing the reset I get speeds up to 55mbps which is nice but also now I get speed of 3.5mbps, which is something I have never experienced before. It is not just time of day or where I live as my interest use/location has not changed. I would have preferred to stay on 20-25 mbps constantly instead of this up and down rollercoaster ride. I had the same problem. My speeds dropped but after doing a hard reset, by pushing the reset button under the modem, (something like a paper clip required) it all turned around and consistent 50+ speeds down and 5 up. Hope that helps.